Before Google came onto the scene with their links-based PageRank, doorway pages were the most effective of the search engine optimization techniques, because they didn’t usually need any pages to link to them, and top rankings were relatively easy to achieve. But with PageRank and link popularity playing such a big role these days, are doorway pages still as effective as they used to be? 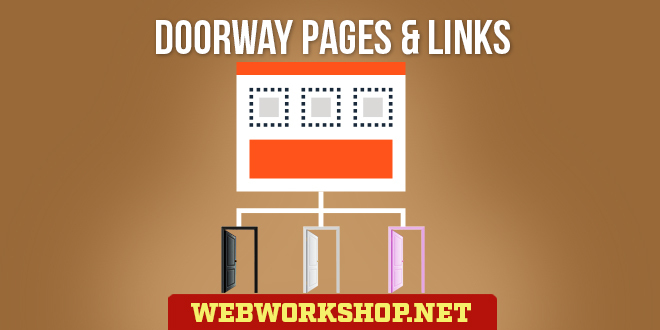 A doorway page is a web page that is optimized to rank well for a particular search term. It is called a ‘doorway’ because people enter the website by clicking on the doorway page’s listing in the search engines’ search results. It is common for a doorway page to be specially created as a doorway for a particular searchterm, but it is equally valid to select the site’s most relevant existing page for the searchterm, and optimize it to rank highly in the search engines so that it becomes the doorway page for that term. Back in the days when search engines based the rankings solely on a page’s content, it was normal for one doorway page to be created for each search term. Each page was submitted to the engines and, if they were optimized better than the competition’s pages, they would achieve top rankings. They could stand alone and didn’t need to be a part of the ‘normal’ site. Therefore, they didn’t need to be designed for users to see, and so they could include an instant redirect to the most relevant of the site’s content pages. Search engine optimization was easy back then! But times change, and search engines no longer base the rankings solely on a page’s content. These days inbound links and inbound link text are both very important to achieving top rankings. An ‘inbound link’ is a link that comes into a page – from the receiving page’s viewpoint it is ‘inbound’. ‘Inbound link text’ is the text on the remote page that users click on. For Google, inbound links and inbound link text are among the most important factors in determining rankings. It means that the traditional, specially created, stand-alone doorway pages are no longer as successful as they used to be because they need to be linked to from other pages on the web, and aquiring good links for them from other websites is just about impossible. What site would want to link to a doorway page?